The Welshman was at the heart of Arsenal’s mature 2-0 win against their much-fancied Italian opponents. 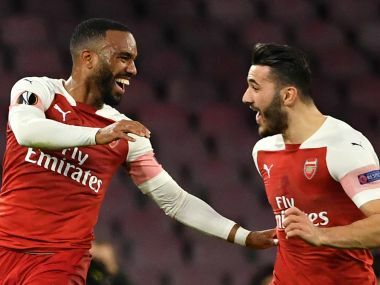 The Londoners combined pressing and aggression with steeliness and solidity either side of the half, but at the end, as Arsenal let slip a decisive third goal and a tie-ending victory, one haunting question remained: would the two-goal advantage be enough come to the return leg in Napoli? After all, in the Round of 16 Arsenal had succumbed 3-1 against French mid-table team Rennes, a scoreline reflecting their woeful away form. 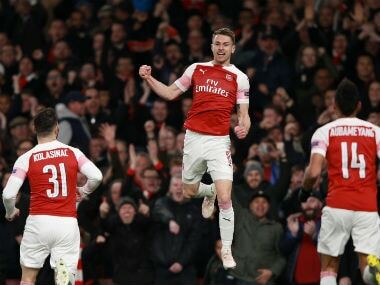 Ramsey’s goal was vintage Arsenal – collective flair underpinned by individual skill resulting in a perfect team goal that was playful yet unpretentious, that oozed class yet lacked an overbearing touch. It was a goal that required quick feet, thinking and a great transition. Ramsey’s goal was beguiling in its simplicity, yet sensational in its execution. Napoli, on the back of a ropey domestic form, were almost lethargic. They left meaningful possession largely to Arsenal and when they did cross the halfway line Lorenzo Insigne, returning from injury, and Dries Mertens, the diminutive Belgian, were scarcely dangerous, drifting in the periphery of the game. Napoli’s new formation under the laissez-faire approach of Ancelotti had little of the Sarriball blueprint that propelled the team to 91 points in last season’s Serie A. In contrast, Arsenal were ‘playerish.’ Indeed, they, at times, reminded on of ‘Wengerian’ times when the club and its fan base were often torn apart by the towering French personality and his many idiosyncrasies , his repetitive flaws and the artistic, albeit unsuccessful, football. 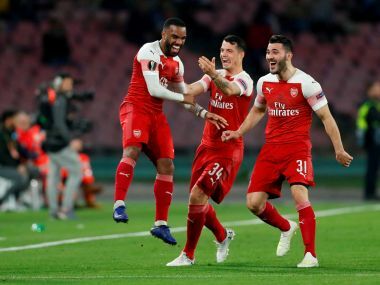 Wenger’s Arsenal often portrayed the game as an art and against Napoli Emery’s team did so as well in the first half, relegating thoughts of a season that has often looked laboured. It was almost going too well for Arsenal and that mere consideration spelled danger for the North London club. A Napoli goal was never far war away and just before the interval Jose Callejon, in all his excitement, didn’t convert a gild-edge chance. It served as a warning sign and Napoli returned from the dressing room with more zest and spirit. The game slowed down in the Italians’ favour whose passing and decision-making became slicker. Arsenal played a high line in defence and broke on the counter. The importance of the away goal, as showcased by Barcelona against Manchester United on Wednesday, dominated the second half: Napoli concentrated on scoring, Arsenal on not conceding. It made for a less spectacular and less intriguing stanza. Arsenal showed sharpness and maturity when Napoli attacked. They no longer pressed but dropped back with five defenders. It was smart from Arsenal, who shed the enterprise of the first half for a dose of realism in the second half. 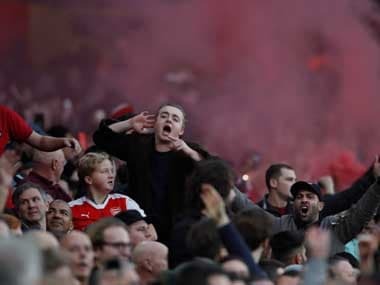 The Londoners were conscious of their own fallibilities and Emery mixed up his line-up, bringing on Alex Iwobi and Henrikh Mkhitaryan to replace Ozil and Lacazette as the Gunners moved away from a 3-4-1-2 to a more conservative formation. It worked even as Ancelotti responded with the introduction of Polish striker Arkadiusz Milik. A single goal in Italy next week should suffice for Arsenal to progress to the last four, that is discounting an unmistakable slapstick collapse from Emery’s eleven.